It's Christina here hoping you are all well. At the beginning of the year, I resolved to use all the unused stamps and papers that are stashed away in my craft room. So here is Christmas Kitchen Tilda, which I thought perfect for Mothers Day. I am totally in love with these pretty Pion papers and can't believe I haven't used them before. 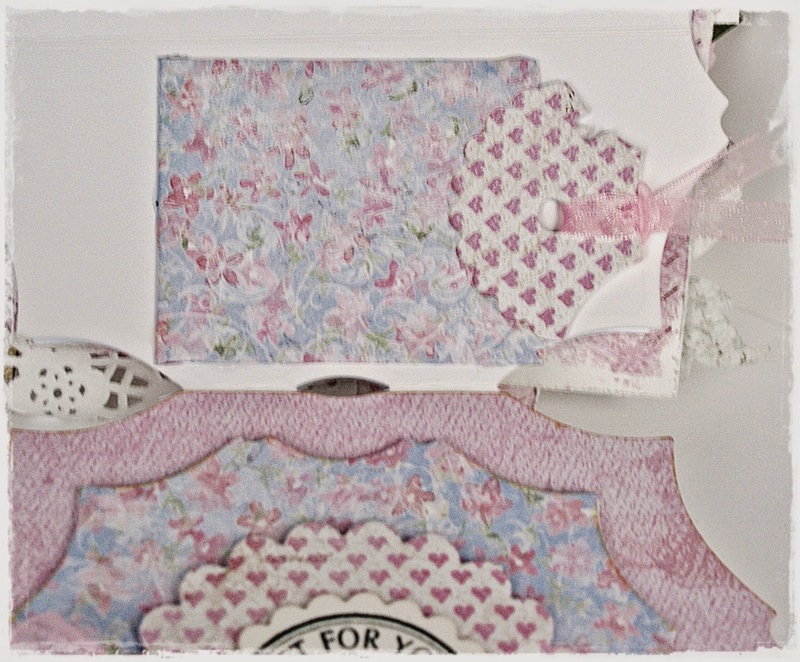 I love pink and blue so I added a touch of pink to brighten the card up. Warning - loads of pictures. 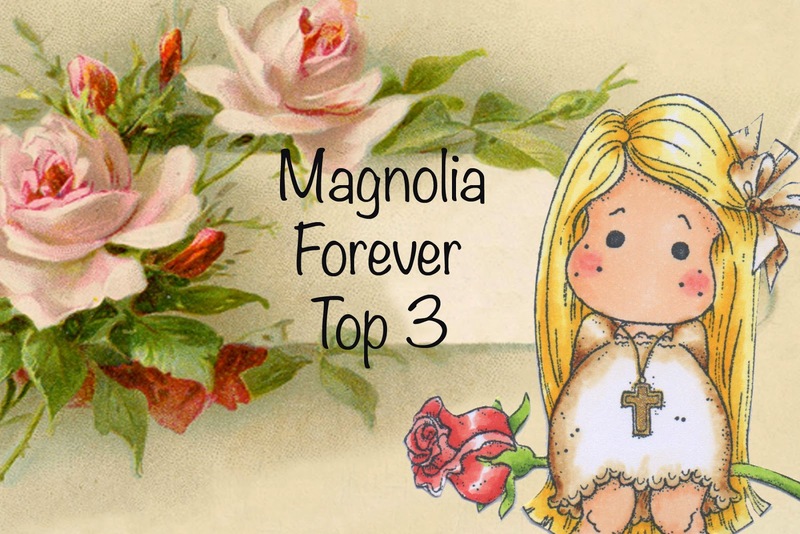 All the dies are Magnolia. The birdcage was cut from the same paper and heat embossed to give a glassy shine. 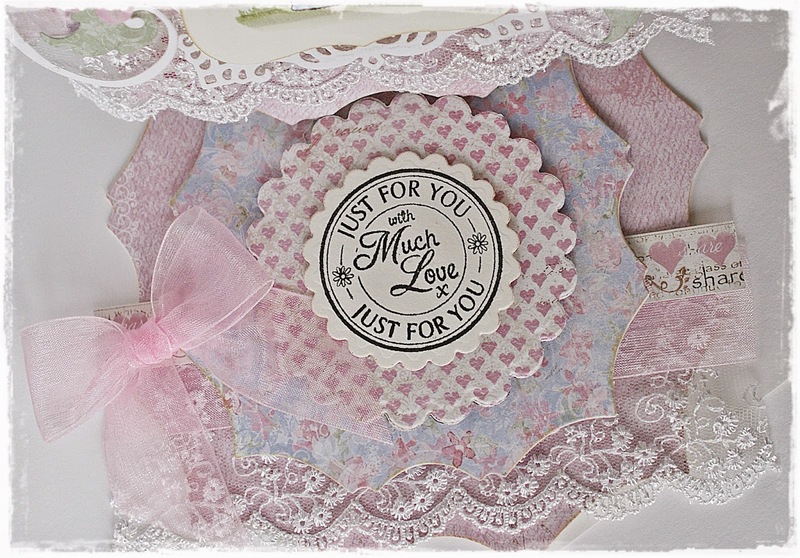 All the lace, ribbon, heart etc. 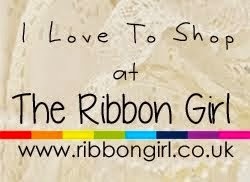 are from the Ribbon Girl. Oh, how I love that diamanté heart, must buy more! 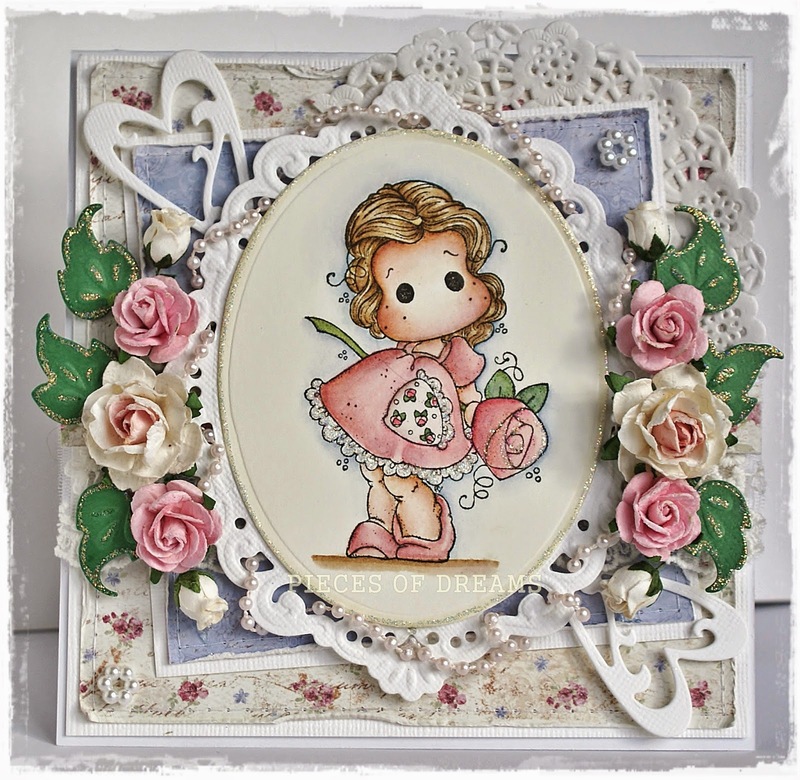 Tilda was coloured with distress re- inkers onto watercolour paper and stitched to match the rest of the card. With Glamour Dust on her apron. There is a hidden tag inside the easel fold for a greeting. That touch of bling - the sparkly heart. 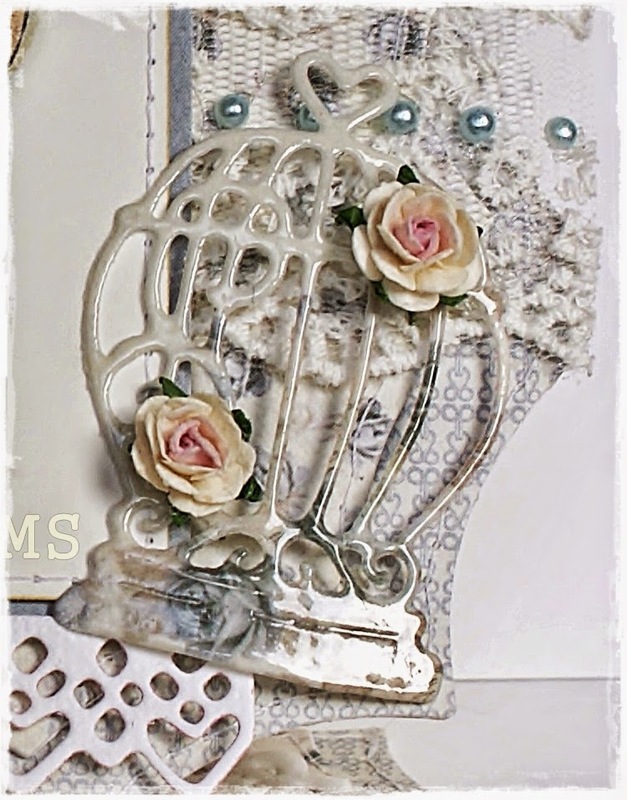 The birdcage- Blue pearls on lace . That's all for now but I'm sure I will be back soon. 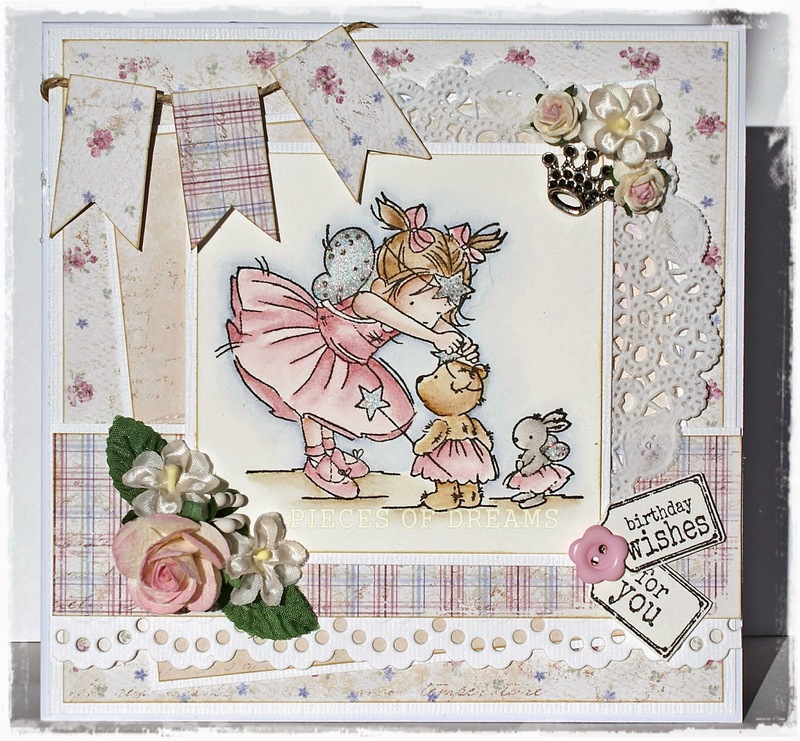 I have chosen Tilda with Big Rose from the Pink Lemonade collection and coloured her with distress re-inkers. Of course I added some bling! Pale pink pearl stringing is intertwined on Tildas' frame. 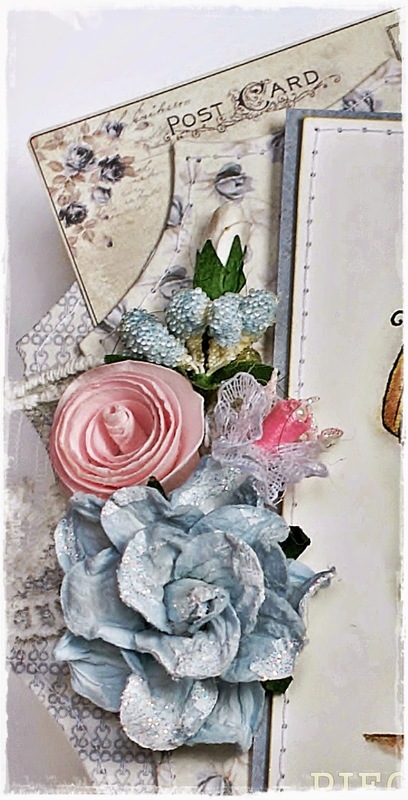 She has Glamour dust added to her lace and rose, also sprinkled on the edges of the leaves. 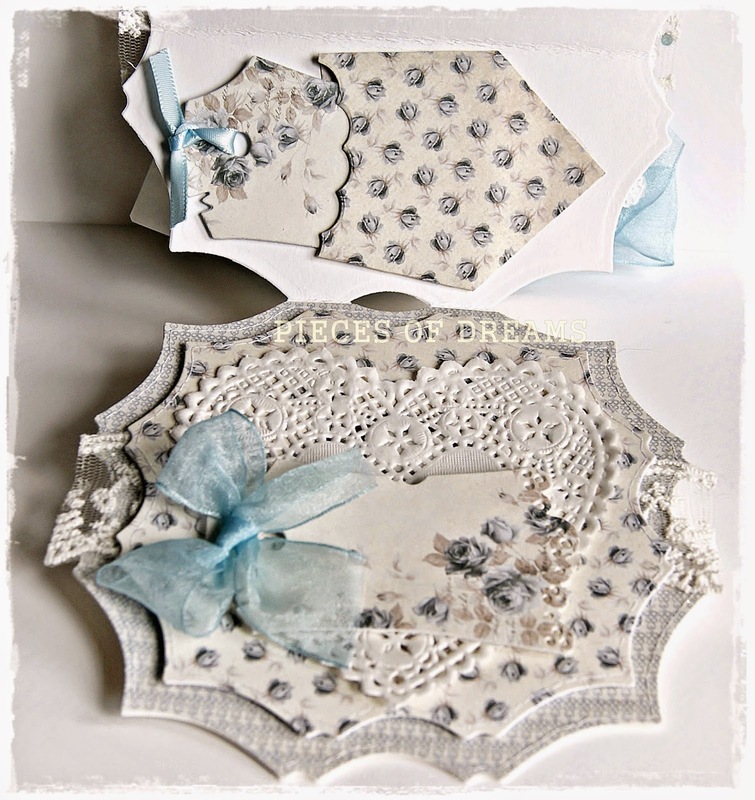 The papers are Maja design, distressed and stitched. The die cuts are all made with Marianne dies. There is some very pretty lace somewhere, peeping out from the roses. 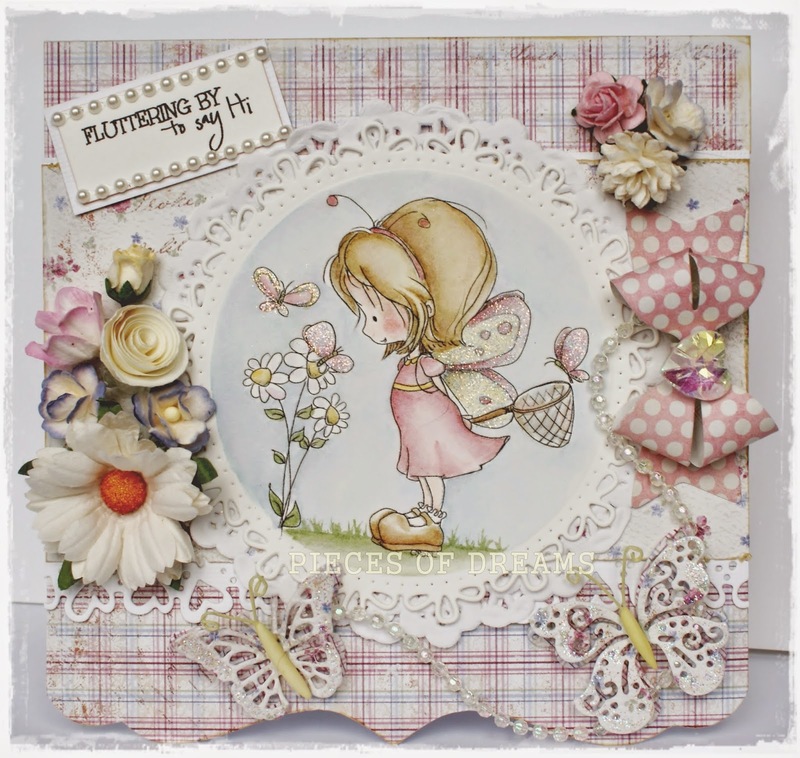 Tilda's Town is a most magical shop specialising in Magnolia Stamps & Cutting Dies. 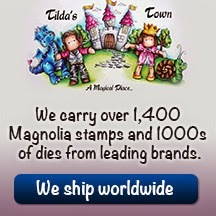 We carry over 1,400 stamps in stock at all times & over 4,000 dies from all your favourite brands. 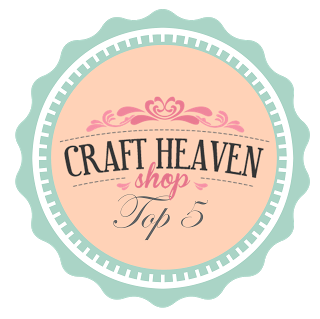 We offer very competitive shipping rates & we ship worldwide. Visit us at Tilda's Town and live the magic. I hope you join in our challenge this week and look forward to visiting your blogs. Lili of the Valley with sentiments from Lili of the Valley. 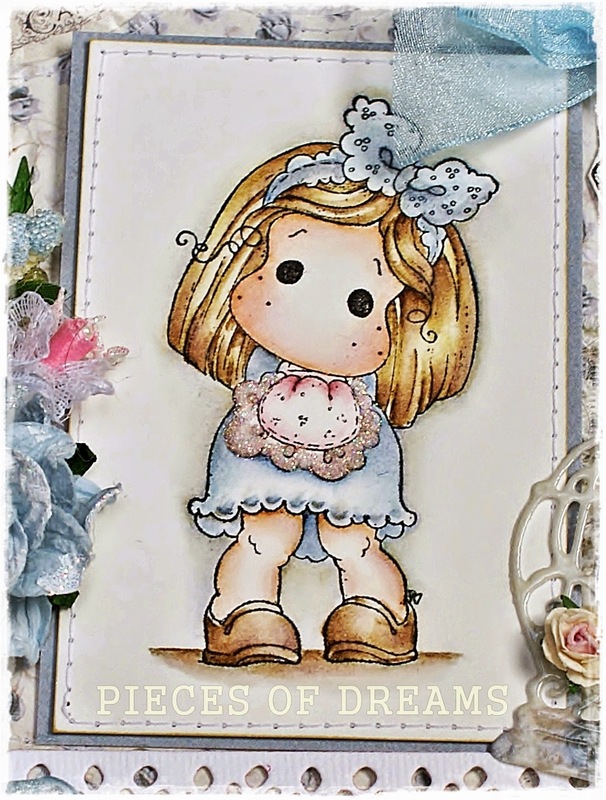 It is coloured with distress inks on watercolour paper with lots of Glamour dust and a little crown charm. The papers are Maja Design, flowers and button from my stash and the flags were just cut out freehand. I've just noticed a hair on the card, courtesy of my Labradoodle who loses her coat constantly. Never believe anyone who tells you they don't moult, first generations often do. She loses hair all year round! Anyway, you can just see the charm in the corner and the Glamour Dust on the wings and wand. Thank you for taking the time to look at my card. 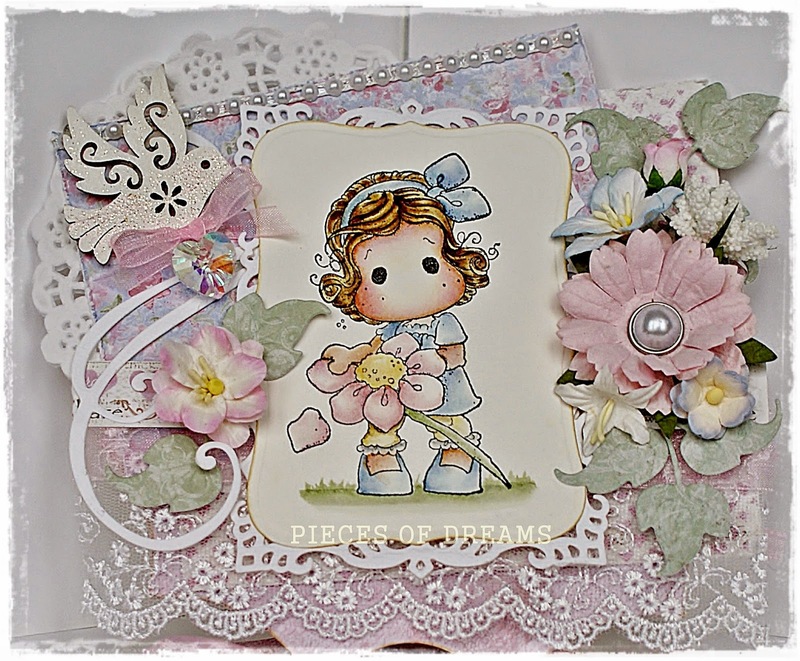 Today's card is " He Loves Me...Loves Me Not Tilda", made with Maja papers and coloured with distress re-inkers onto watercolour paper. The little wooden bird has been painted with gesso and lightly embossed with shabby Frontage. The card shape is cut with Go Kreate dies. 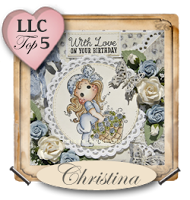 Others are Magnolia swirl, Marianne leaves and Spellbinder circles/labels. ribbon and flowers are from the Ribbon Girl. The tag is hidden in the fold of the card. It's snowing here in London. Just a little bit and melting as it hits the pavement in strong sunshine. Bitter cold though. This is my first Tiddly Ink card. I recently found these sweet little stamps. I've a few of the new ones pre-ordered from Bunny Zoe. This is made using a digi' download, basically because I have no patience and wanted to make a card now. Her wings and butterflies have added Glamour Dust and the bodies of the butterflies are made from Fimo. Papers are Maja Design, dies are Magnolia and JoyCraft. Flowers and pearl string - Ribbon Girl. Thank you for taking time to visit me here today. 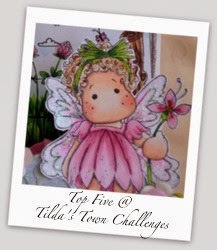 I almost forgot to post my TILDAS TOWN DT card ! The days go round so quickly. Its the first of February today, nearly Spring! So. this weeks challenge is "Freezin' Season". I didn't want to make a Christmas card ... I'm all Christmas'd out. All my Tilda's had holly or Christmas hats on, so I searched in my image box and found an image from a few years ago which I coloured with my copic pens. It's little Ice Skate Tilda. 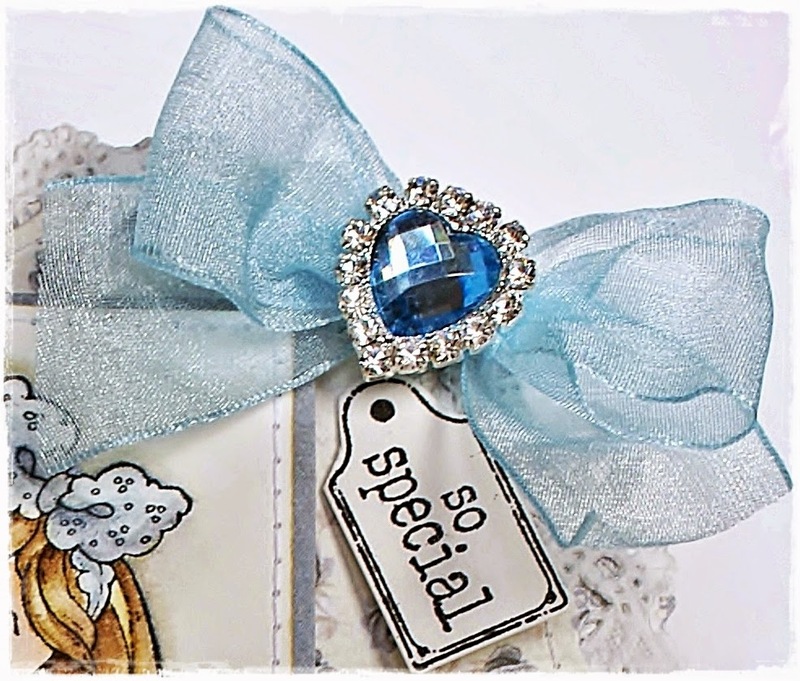 With the help of a few die cuts and some Maja papers I made this sparkly, cold weather card. I look forward to visiting your blogs and leaving a comment or two. Stay safe.